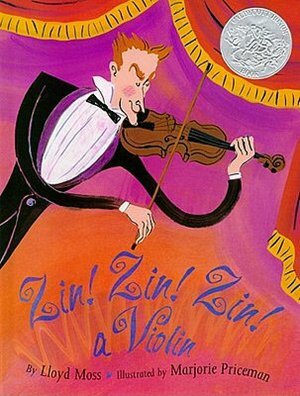 Zin, Zin Violin - B. R. E. A. K.
"Today I am stronger than yesterday; tomorrow I will be stronger than today"
B. R. E. A. K.
This lesson will include guided instruction and collaboration of groups. Instruction will be modified to meet the needs of all students in the class. This Language Arts lesson also incorporates the arts (music) and mathematics. Students will create a word sort Wall based on the instruments in the story Zin! Zin! Zin! A Violin and the order in which they join the orchestra. Scaffolds for English Language Learners and Children with Special Needs may include: Engaging in Grand Discussions about the instruments and the story, reading the story aloud, watching a You Tube Video of the story which plays the sounds of each instrument in the story; students will be paired, if necessary, and students will use visuals and words to help them identify the vocabulary of the story and to further create their word sort. This lesson allows for multiple intelligences (learning preferences) to be used. Verbal/Linguistic: Students will listen as the story, “Zin! Zin! Zin! A Violin” as it is read aloud. The story will also be told via a media clip so students could listen to the sound of instruments. Spatial/Visual: Students will observe illustrations in the book that will help them identify the instruments in the story and the musical family in which each belong. Students will also use pictures of instruments to complete their word sort. Kinesthetic: Students will move from their desks/seats into a comfortable area in the classroom (Rug area) for a read aloud session. Students will be able to move around when creating their word sort activity. Interpersonal: Students will interact with each other and learn through their interactions as they create their instrument and vocabulary word sort. Intrapersonal: Students will learn through their own interests and goals. (1) What is an orchestra? (2) What are some words used that describe order/place such as first, second, third, etc.? (4) How do you use suffixes and pre-fixes to help you understand root words? Students will use context clues (i.e. definitions, illustrations, logic, etc.) to identify the meaning of words (vocabulary) contained in the story. Students will participate in discussions during read aloud. Students will explore their own thinking and deepen their understanding of specific vocabulary by using morphology (i.e. affixes, pre-fixes), to analyze vocabulary. Students will understand the power of word choice and vocabulary in composing a story. Students will explore, learn and engage in using different strategies to learn unfamiliar words. Students will explore vocabulary contained in the story (such as Solo, Duo, Trio, etc.) to identify order of the story. 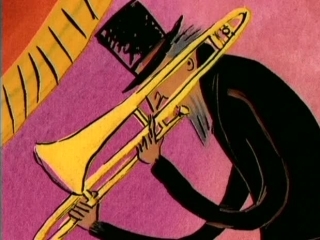 Students will explore vocabulary contained in the story (trombone, trumpet, etc.) to identify the instruments that will compose the orchestra in the story. Students will create a Word Sort using different specific vocabulary contained in the story. Students will engage in oral language to explore ideas and communicate with others. Students have an understanding and knowledge of different elements of a story (example: title, characters, settings, objects and events from prior readings and discussions). Students understand and have knowledge on where words, titles and pictures are positioned in a story. Students understand and have knowledge of morphology (pre-fixes and suffixes). Students have been using different context clues to help them understand new vocabulary. Students have been engaging in different word activities (word wall, word sort) to help them learn and understand vocabulary. 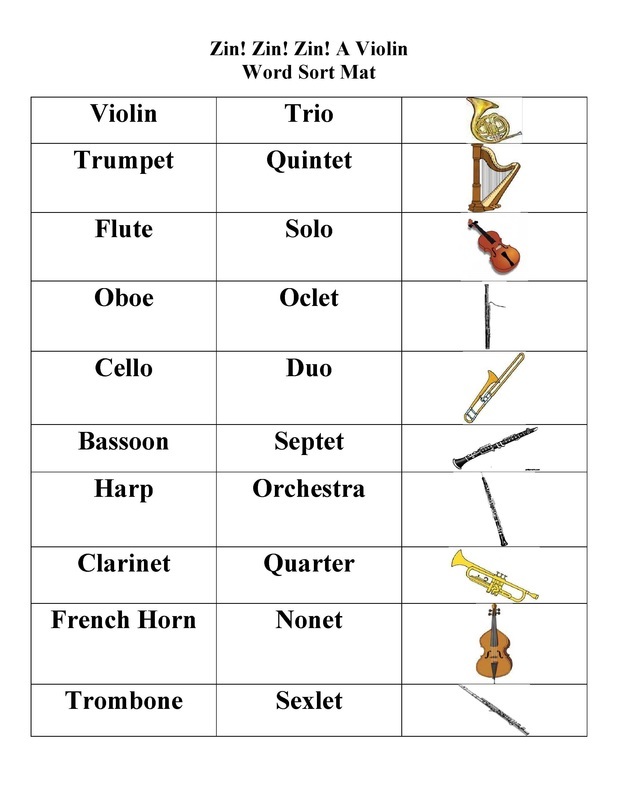 Students will gain understanding of the 10 instruments of the orchestra (trombone, trumpet, French horn, cello, violin, flute, clarinet, oboe, bassoon, and harp) by using proper vocabulary. Students have assigned big ziploc plastic bags that contains 3 – 5 books that are at their individual reading level and preference. Students are aware that prior to beginning the language arts lesson they are to collect the bag with their name and engage in independent practice reading for 5- 10 minutes. They can then obtain their reading log and write a sentence or two about the reading they just engaged in. • Hook to lesson: Teacher will have photographs of instruments (i.e., trombone, trumpet violin, cello, etc. ), in display. Teacher will play an instrumental CD and ask students to close their eyes. Teacher will let the CD play for a minute or so and then explain to students that they were listening to music being played by an orchestra. Teacher will ask if anyone can identify any of the instruments pictured in display in the music they were listening to. • Explanation of Objectives: Teacher will explain to students that today they will be learning all about a group of instruments that join together to create an orchestra and the order in which instruments come together to create an orchestra. Teacher will explain that they will explain that she will be reading a story, “Zin! Zin! Zin! 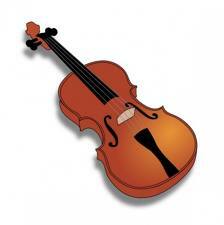 A Violin!” that will mention ten different instruments and the order in which they join the orchestra. Teacher will remind students that they have been learning on how to use context clues to identify the meaning of words and as she reads the story aloud, she wants students to listen closely for context clues for their vocabulary lesson. Teacher will explain that students are to explore vocabulary contained in the story and listening for special clues that will help them identify key words in the story. Teacher will explain for students to keep in mind morphology words (pre-fixes and suffixes) as they listen to the story so that we can discuss them later and use certain clues and words to create a human word sort and later a word sort wall. Teacher will show students pictures of each of the instruments that are contained in the story and identify them by name. Teacher will read aloud to students the story, “Zin! Zin! Zin! A Violin!” by Lloyd Moss. Teacher will tell students that she is first going to read the story and have them listen out for the names of instruments and have them listen to context clues as to the order in which they join the orchestra (example, solo, duo, trio, etc.). After students listen to the story teacher will ask students if they can identify the instruments that were named in the story by using proper vocabulary. Teacher will explain that now students will work in groups of 5 students and create their own word sort chart by using specific vocabulary from the story. 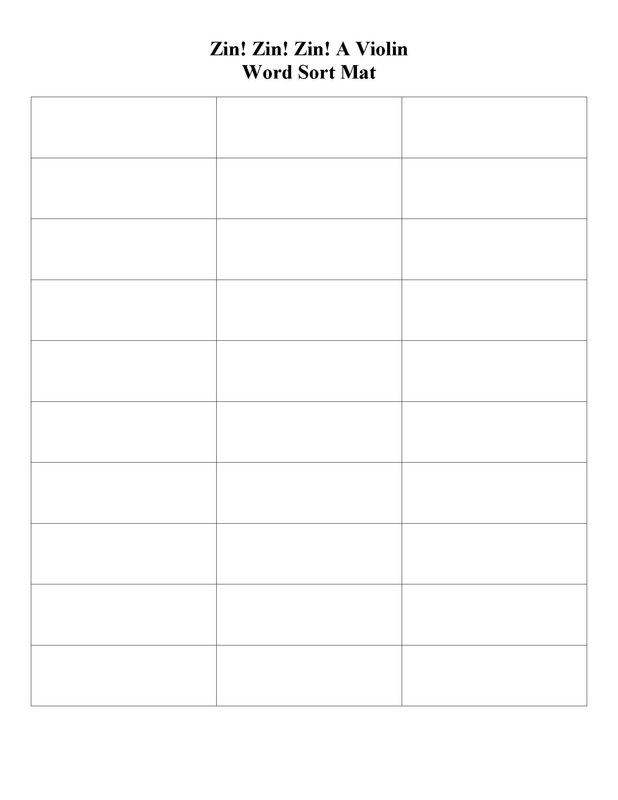 (Teacher will model this activity for students by using an empty space on the wall and pasting the word solo in one column, the word trombone in the next column and a picture of the trombone in the third column). Students will work on this activity in groups and afterwards they will work together as a class to complete the main word wall located in the classroom by putting the instruments in order in the word sort wall. Students will work in groups to create their own word sort charts which will later be used to create the master or main word sort of instruments and the order in which they join the orchestra for the classroom. 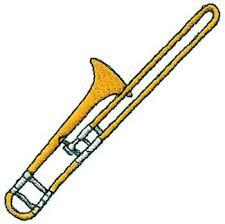 Students will create human word sort using pictures of instruments as the teacher reads aloud. Students will later create word sorts using proper vocabulary to list the order in which each instrument joins the orchestra. Teacher will assess students based on their knowledge and understanding in using proper vocabulary and order when creating their word sorts.